"In this day of 200 mph homebuilts, the 60+ year old design is not surpassed in overall handling and performance by many aircraft. To true "Swifters" no explanation is necessary. If you haven't flown one, perhaps no explanation is possible." Anonymous. When you live near an airfield, one of two things will happen - you'll either be besotted with planes or you'll hate them. For Mike Brown, it was the former and this passion has continued his whole life. Mike, 60, grew up in Walmer, Port Elizabeth and, unbeknownst to him at the time flying was in his genes. His father, who was unfortunately not accepted for pilot training for the SAAF in World War II because of his eyesight, served as a ground support member of 3 S & T Column which was attached to 3 Wing which in turn was attached to the Desert Air Force. He also later learned that his grandfather served in the Royal Flying Corps during World War One and did his ground training but the war ended before he qualified as a pilot. A copy of his ground-training notebook is one of Mike's special treasures. A squadron of Harvards stationed in Port Elizabeth was forever over flying the family home and the infernal racket of the Pratt & Whitney's' must have ignited some spark in young Mike. He started building balsa models of aircraft and flying control line home designs powered by the Baby Bee and Golden Bee engines in the back garden, losing many an aircraft to the telephone wires that encroached into his private airspace. 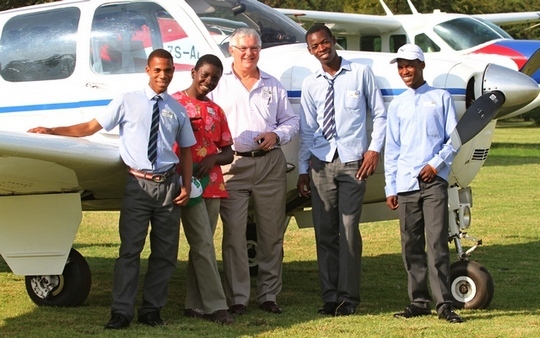 In 1974 and in his 5th year of studying medicine he and a friend decided to join the UCT Flying Club. It was maybe not the ideal time to start looking for distraction but he never regretted it. "It wasn't difficult to choose between attending a dermatology or perhaps a gynecology afternoon practical session and a flying lesson in what was then the GF Area of Cape Town - over the southern suburbs extending from the beach at Muizenberg to the Groote Schuur Hospital and UCT Medical School where I should have been spending my time!" Even though by today's standards the cost of R9.00 per hour solo and R11.00 dual sounds cheap, for a student it was expensive and the lessons didn't come without sacrifice. On 24 February 1975 with 44 hours and 30 minutes of flight time and exactly 1 year and 1 day after his first lesson, he obtained his PPL. He remembers back to his first flying lesson. 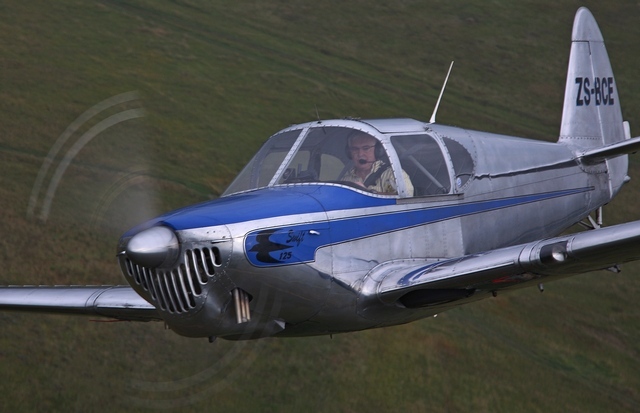 "It was scheduled to have been at what was then DF Malan airport in a Cherokee 140 with Paddy Brennan as my instructor. However when I got there I saw someone loading luggage into the Cherokee and, to my dismay, was told that the aircraft was booked for the weekend for some advanced flying/navigation at Knysna with the same Paddy Brennan. You can imagine my elation, however, when I was invited to accompany them. I ended up having my first lesson from the old Thesen Island airfield." After his first lesson at Knysna his next lessons were with then Captain Joost Cloete, Paddy Brennan and Del Colussi who sent him solo. Mike now has more than 1 500 hours and 27 different types ranging from the Tiger Moth to the Piper Chieftain, including the somewhat uncommon Beagle Pup and Fuji 200, recorded in his logbook. During the late 70s and early 80s he was a member of the Algoa Flying Club when Ray Limbrick, a fellow member, approached him and suggested that they form a partnership to purchase an aircraft he had heard about. The plane, a Globe Swift ZS-BRY, had come off second best after an altercation with a fence and was now lying in a state of disrepair in a hanger at Lanseria. It was Mike's first exposure to the Swift and it proved to be the start of a love affair that would be consummated twenty years later when he saw two Swifts for sale. On the 20 June 2000 Mike bought ZS-BCE from Aircraft Sales International. Both advertised aircraft (BCE and BDB) had previously belonged to Graham Ross and had, coincidentally, been based at Vereeniging where BCE today is hangered. Although sold as a going concern she required significant additional restoration including an engine overhaul, so it was not until February 2003 that Mike was able to complete his conversion to type with Glen Dell who so sadly lost his life eralier this year during the Secunda Airshow. 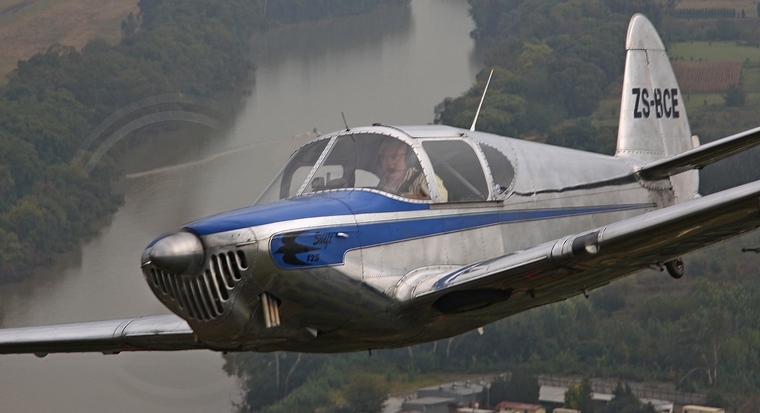 Even though each flight is special for Mike, he still vividly remembers his first cross-country after getting his conversion when he had very few hours on the aircraft. He set off from Vereeniging to meet up at Gariep Dam with Graham Fig, a friend from his University days who was flying the Vansin from Cape Town. He went via Tempe and he admits to being anxious not only at the prospect of a 2-hour flight but also at the thought of having to manage a cross-wind landing at a strange airfield. Despite his misgivings and nerves, both pilots landed around the planned time and without mishap. He remembers, "While we were refuelling, a local approached me and, addressing the assembled crowd, loudly proclaimed, 'I can see you've at least got grey hair, this is no easy aircraft to fly!'" They subsequently explored the region and at Aliwal North Mike did his first grass runway landing in the tail dragger. There have been a few more nerve-wracking moments, which undoubtedly have added a few more grey hairs! The first was a throttle jam at around 2200 rpm, which resulted in Mike having to do a dead stick landing at Vereeniging. On another occasion, while practising a simulated forced landing, he applied carb heat during the descent. After having decided that he would have made the chosen field he discovered that he had very little in the way of power on initiating the go around. Richening the mixture, it got worse and hanging there with gear extended and flaps out as the field disappeared behind him and with insufficient power to climb, his options were diminishing fast. Leaning the mixture, he found to his relief that the power increased, so he retracted the gear and flaps and carried on leaning more until nearly at idle cut-off until he finally had enough power to climb back to Vereeniging. The culprit turned out to be a piece of asbestos cloth from the hot air shrouds around the exhaust that had broken off and had been sucked into the carburettor - an AD that had been missed for 50 years! 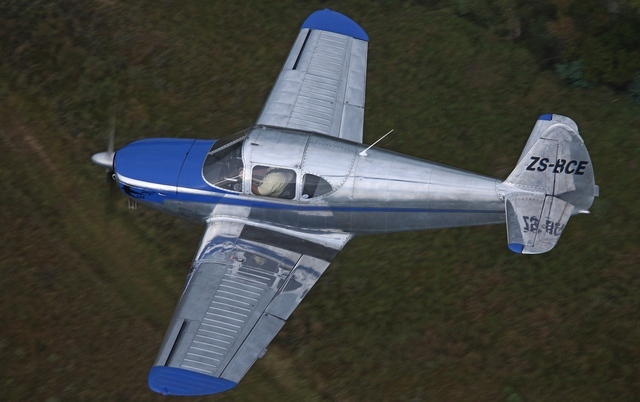 The Globe Swift was designed by R S "Pop" Johnson to look and handle like a WW II fighter and was supposed to be the airplane of choice for fighter pilots returning from the war and was advertised as the "All Metal Swift". At a later stage, John Kennedy, president of the Globe Medicine Company who formed the Globe Aircraft Company, acquired the design. The Swift received its Type Certification on 22 September 1946 and Temco built the last aircraft on 23 August 1951. Always something of an odd bird, the Swift gained a reputation as being a hot airplane that was hard to handle - probably as a result of it being much lighter on the controls and much more willing to do the pilot's bidding than any of its peers. However, as a mini fighter it lacked power and the 145 hp Continental became a quick and easy upgrade for the original 85 hp engine fitted to the GC-1A. The Swift has a wingspan of 29' 4", is 20'10" long and has a useful load of 585 lbs, carries 27.6 US gallons of fuel and has a range of approximately 2.5 hours with reserves at cruising speed of 140 mph. Its Vne is 185 mph and it stalls at <40mph. Of the approximately 1 500 Swifts built, about 12 found their way to South Africa of which the whereabouts of only 5 are currently known. 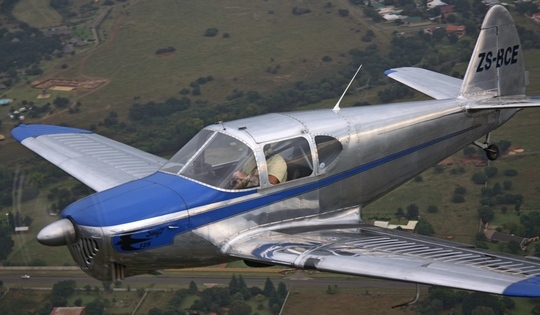 ZS-BCE, serial number 1270 was built in October 1946 and besides probably being the most original, is also one of only three still flying in South Africa. She was first registered to a Mr. T Mansfield of Cape Town on 31 January 1974 and was sold to Mr. A.T. Matthew of Fort Beaufort on 7 October 1976. After his death she was bought by Mr. Graham Ross who based her along her with his other Swift, ZS-BDB at Vereeniging. When Mike bought her on the 14 June 2000 she was listed as being registered to Mr Quinton Warne. In the world of the Swift community, there are those who view the Swift as the basis for a serious go-fast machine and those who strive for absolute originality. The annual Swift National convention, held in May at the Swift Museum Foundation headquarters in Athens, Tennessee, awards prizes for both the most original and also the most modified Swift - the basic Swift design is probably one of the most highly modified of all types. With the imminent introduction of the LoPresti Fury, a highly modified and modernised version of the original Swift design, the competition is going to be tough! Mike is a very active member of Chapter 322 of the SA Experimental Aircraft Association and coordinator of the Young Eagles Flights where he, like so many others, selflessly flies youngsters who have never before had the opportunity and in doing so hopefully create a passion for aviation and a new generation of aviators.